To find the best air purifier for odors we should take a look at what odors are. We can look to see how they are formed. We can discuss types of odors. A look at air fresheners would be helpful. We find out how to get rid of odors. Lastly we can find the right solution for you. Odors are what we perceive as smells. Our noses have an olfactory nerve. 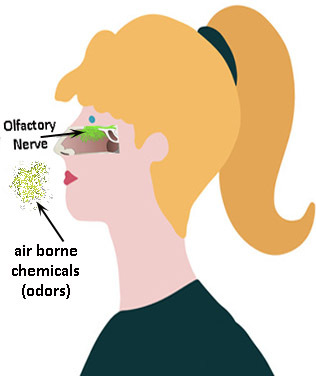 The job of this nerve is to interpret chemicals in the air as scents. When air enters our noses these nerves provide us the sense of smell. To remove odors from the air you must remove the gases that cause them. Odors are created from natural and manmade items. They happen when particles are released as a vapor (volatilized). This usually happens when things evaporate. It can also happen when things rot or decompose. Regular chemical reactions can create the gases that produce odors. What Odors do you need to remove? Smoke can come from many sources. Almost all smoke comes with its own unique smell. Cigarettes and cigars pose a real challenge to your air purifier. Make sure you have an air purifier that can handle these big jobs. The Kitchen is a place of both pleasant and obnoxious smells. A simmering pot of soup can be a delight. The trashcan might hold odors that will make you lose your appetite. A room air purifier is great at checking these localized odors in place. Our homes have many distinctive odors. If we have a baby, there are diapers to deal with. Young men and women might produce body odor. An older home might have a damp or musty smell. Depending on who lives in your home and when it was built it will have a scent all of its own. Chemical odors occur in the home and the work place. In the home we might have the odors of cleaning supplies. In the work place there may be chemicals that are used in manufacturing processes. Chemical odors pose a higher level of threat to our health. We should be very careful in dealing with Chemical odors. The key to removing odors is activated carbon . 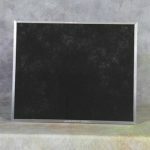 Activated Carbon is incredibly porous, Its surface is made up of countless nooks and crannies. 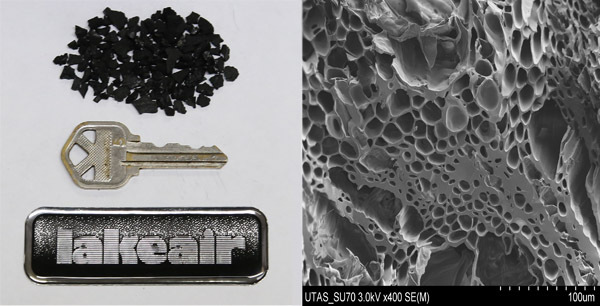 1.3 grams of activated carbon (see below) has a surface area are equal to 1 Acre in size. Odor molecules attach themselves to the surface of the carbon. Here they are trapped. 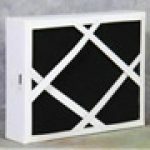 LakeAir activated carbon filters are your key to removing odors in your home and business. Best Air Purifier for odors in the home. Small rooms like Kitchens, bathrooms and bedrooms are great candidates for a small room air purifier. 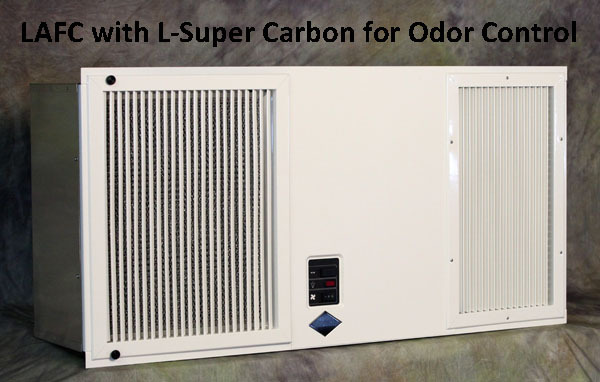 The LakeAir Excel with the E-Super Carbon will remove odors and clean the air in a room up to 15′ x 15′. The Excel is a light weight electronic air purifier with activated carbon filter. It will remove cooking smells from the kitchen. The Excel eliminates human waste odors from the bathroom and people odors from the bedroom. The Excel Media model with the E-Super Carbon only costs $299.00. It has a MERV 11 Media filter. 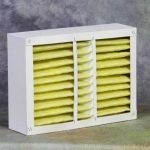 It will clean the air of pet dander, pollen and the other pollutants that should be removed from your homes air. Power consumption for this unit is 72 watts or around $20.00 a year. The Excel is quiet, only making 45 db(A). The same as a quiet urban day. The Excel is totally made in the USA and ships from Racine WI. Large rooms and living areas can be odor free. 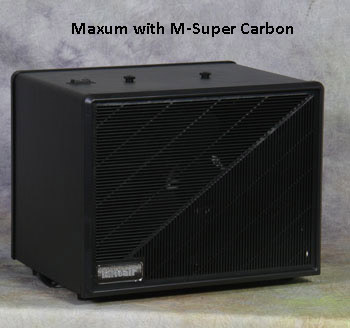 The Maxum Air Purifier with M-Super Carbon will eliminate the odors in a room 25′ x 25′. Keep the air odor free in your living room or family room. A small ranch will smell fresh with one LakeAir Maxum. You might want to add a 2nd unit if odors are particularly stubborn. The Maxum is a commercial strength portable air purifier. It works well in large rooms to clean the air and remove odors. It is quiet and light enough to move around. It is a throwback to when appliances were made of all metal. The Maxum supplies 275 cfm of pure air on high and 200 CFM on low. The New Maxum HEPA can crank out 400 CFM of super clean air. 17 inches by 15 inches and 13 inches high is the size of all 3 Maxum models. It’s about the size of a small microwave. Power usage is 102 watts. Figure you will spend $29.00 a year if you have it on 24 hours a day all year long. The Maxum is a quiet unit with sound level 38 to 48 decibels. That’s like a quiet day outside. The Maxum HEPA at its highest speed is a bit louder. Like all LakeAir products, the Maxum has a limited 7 year warranty. How good is the Maxum at removing Odors? 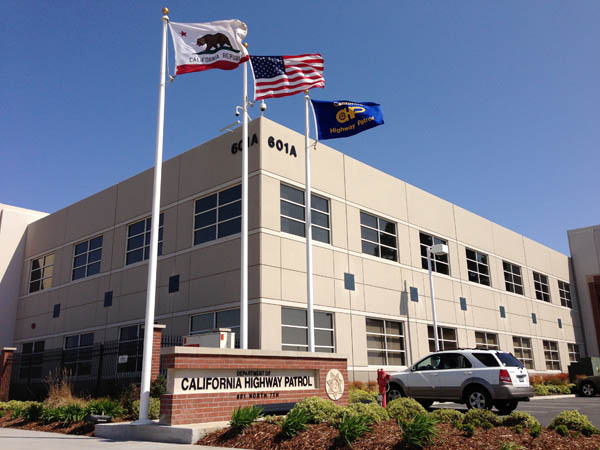 The Maxum Media Air Purifier has been chosen by the California Highway Patrol to remove odors from all of Its evidence rooms. The M-Super Carbon filter protects the brave men and women of the CHP. The odor eliminator air purifiers from LakeAir will protect your home and business. The CHP trusts LakeAir, you should to. The LAFC is designed to be mounted into a 2′ x 4′ ceiling grid. It uses powerful centrifugal blowers to move air through its filter systems. Paired with the L-Super Carbon, the LAFC is a strong commercial odor eliminating air purifier. Do you have a space that needs air free of particulate and odors? But you don’t want a hulking air purifier to disturb the natural flow of the room? The LAFC blends into the ceiling. It is very quiet for a commercial odor control air purifier. These units are very popular in cigar bars, restaurants and other upscale settings. 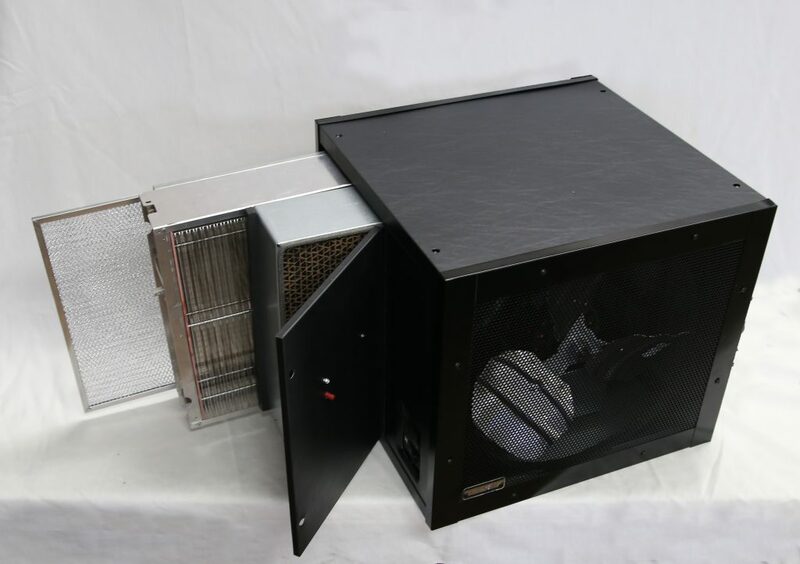 The LAFC is available in HEPA, Media and Electrostatic filtrations platforms. 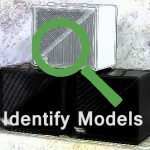 The amount of clean air provided varies from model to model and speeds. The CFM produced ranges from 400 CFM on Low speed with a HEPA to 1300 CFM on high speed with a dual blower Electrostatic. The LAFC weighs about 90 pounds. It has 4 1/4-20 nut inserts and supplied eye bolts. This make supporting the LAFC simple. 44 to 52 decibels of fan noise is emitted by the LAFC. The LAFC should allow for quiet conversations in the room. Cleaning efficiencies of 95% to 99.97% are achieved depending on model. The LAFC carries a 7 year limited warranty. It is available in both black and White. The optional L-Super Carbon turns any LAFC into a heavy duty odor eliminator. The LA2000-OC was created specifically for odor Control. It features a 10 pound activated carbon filter. This odor magnet will sanitize smells from a 1600 sq area. The LA2000-OC works better than most HEPA solutions at removing odors. The Key is multiple air turns. An Average HEPA unit will turn the air 2 to 3 times an hour. 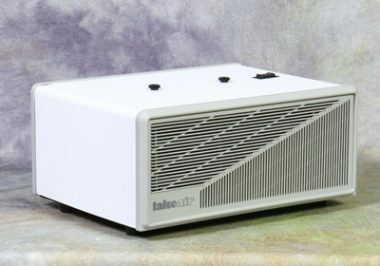 The LA2000-OC can clean the air 6 times on hour. It removes all the odors and 97% of other indoor air pollution. The air gets cleaner with every cycle. Not only does the LA2000-OC remove odors, It removes harmful VOCs. Many commercial applications create these dangerous fumes as a byproduct. These gases can harm employees and products. 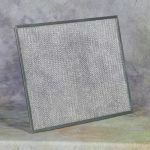 The 10 pound ultra-carbon filter will remove these VOCs from the air in your business. Commercial venues like dry cleaners and plating operations use our odor control products. The LA2000-OC processes 1200 CFM of air. That is enough to clean the air 6 times an hour in a 1600 square foot room. This unit weighs 109 pounds and can be hung from the ceiling. We sell a bracket that allows you to mount the LA2000 on the wall. The size is roughly a 22.5 inch cube. Colors available are black and white. The LA2000-OC draws 6.8 amps on high speed. It is available in 115 and 230 volt models. Sound levels of 46 to 65 decibels are produced. This is not a quiet unit. But it gets the job done. It includes a 10 pound activated Ultra-Carbon filter and a 97% efficient washable electronic filter. At the very best, air fresheners only mask the scent. In some cases they make the air in your home worse. A study from the NRDC showed 12 leading air fresheners contained potential cancer causing agents called Phthalates. Air fresheners do not remove any odors. They just add more!